Federal Regulators Propose Tougher Rules Governing Wall Street Bonuses : The Two-Way Executives who get their firms in legal trouble could be forced to pay back bonuses retroactively. 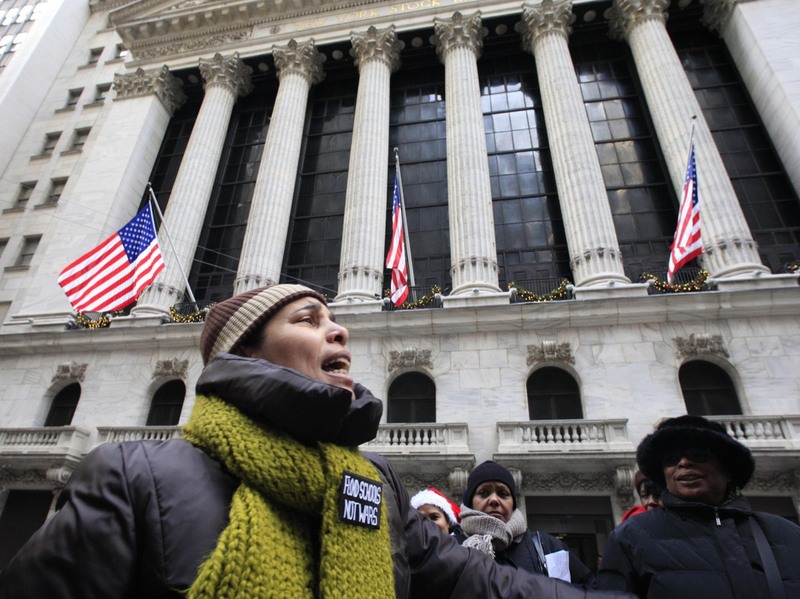 Demonstrators voiced opposition to year-end bonuses for Wall Street executives, during a protest outside the New York Stock Exchange in December 2010. Top executives at the biggest Wall Street firms would have to wait four years to collect most of their bonus pay and could be forced to return the money in the event of wrongdoing, under proposed rules unveiled by federal regulators. The rules, which were released Thursday by the National Credit Union Administration for public comment, say senior executives at firms worth more than $250 billion must wait to collect 60 percent of their bonus pay. Executives at firms valued at $50 billion to $250 billion would have to wait three years to receive half their bonuses. The rules cover banks, investment advisers and credit unions, as well as mortgage giants Fannie Mae and Freddie Mac. Once executives receive their bonuses, they can be forced to return them if it later turns out they took inappropriate risks or engaged in actions that got their firms in legal trouble. Many big Wall Street firms already delay bonuses for three years and allow bonus "clawbacks" in the event of wrongdoing by executives, but these practices would be codified as federal law. The new bonus regulations were mandated under the Dodd-Frank financial overhaul, to address one of the big concerns raised by the subprime housing crisis, according to a draft copy of the rules released by the NCUA. "Significant losses caused by actions of individual traders or trading groups occurred at some of the largest financial institutions during and after the financial crisis." The regulations were crafted by six federal agencies, all of which must now sign off on them. One of those agencies, the Federal Deposit Insurance Corp., is expected to vote on the rules Tuesday. "Bank compensation typically includes a salary, stock and a bonus awarded at the end of the year. In firms regulated by the SEC, asset managers are paid through fees based on the scale of their funds and the success of investments. "Regulators also have had to wrestle with the concept of applying rules meant to curtail risk to an industry that is based on taking risks." Financial industry officials say the new rules will make it harder to attract top talent and exacerbate the flight of people away from banking, The Wall Street Journal reported. "Already, the industry says it has seen people leave more traditional banking jobs for areas where compensation has gone untouched, such as hedge funds and startups, including in Silicon Valley," the Journal said.